Of course I have to include her! Although she does not really update that often, she is one of the blogger I really look up to. 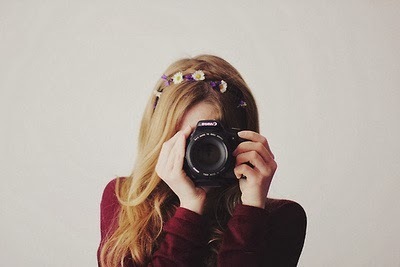 On how she took her pictures, how neat is her blog and just amazing! I love how cute her blog is and her pictures are really amazing! Presenting to you, my internet idol, Zoella! One of a beauty blogger I love. I love how she review things and I don't know. I just love reading her blog as well as how she took pictures for her product review. Just amazing! An Indonesian fashion blogger. Top notch high fashion scene. She can wear anything and look fabulous. I love looking at her fashion pictures. It inspiring although I don't think I will wear something like that. Another Indonesian blogger! If I am not mistaken, she is one of the best Beauty Blogger in Indonesia. Presenting to you Stella Lee! She love Japan if you can tell! I have been reading her blog like before she converting to her new blog. At first she only have blogspot.com and then she convert to stellalee.com. I love how she review her product, she is also not sombong. Although she is famous, she always find times to reply to her blog comments. Another, another Indonesian blogger. Haha. I discover her last year and I was like, is she using like a Korean model for her review. HELL NO! It is herself. Super pretty man! She does not look Indonesian at all. She look so Korean! She also love Korean cosmetics and she have review a lot of them Her review is very detail! I love it! I discover her around last two years if I am not mistaken. She always change her layout design. hehe. But all of her layout designa re super amazing pretty! She is from Philippine if I am not mistaken. Followed her even before she gave birth to her cute daughter! Her review are amazing, plus her pictures are absolutely amazing too! One of my favorite Fashion blogger! Kristina Bazan! I discover her when I have this obsession towards YSL Rouge Volupte, then I saw her pictures where she had this photoshoot with the lipstick. All of the lipstick look good on her. Jelly. She also have a very high taste in fashion which, erm I may not afford right now. Haha. Well, I just love her fashion blog! Very inspiring! Whenever I can watch youtube, i go to my favorite youtuber blogs. So I can get short easy loading updates. Haha. She also updates about her lifestyle and beauty review here. Which i find easy! Same as Beauty Crush, I don't know. i just look looking at amazing photos for product review. So stylesuzi blogs have it all! Another fashion blogger I love! I don't know why I have not seen her youtube anymore. It just not in my subscription box, and I have to like find her channel and watch it. So her blog does the "synopsis". i love her fashion photos and style. Just amazing. My Art and Graphic inspiration idol! The one who design Zoella blog! Her work is amazing and I do have some purchase from her design shop. i love how she updates not only beauty stuff, but also motivation and her life. Her pictures are gorgeous and her blog is just awesome to be on! A fun quick beauty blog! I think this blog owns by a lot of admins. They pictorial are very popular in Pinterest! A cute kawaii blogger! She is bold but she is confident! Her style are just out of this world but just looks amazing on her! She also review some korean product, cute packing stuff and interior design stuff. Love her pink kawaii blog! Addicted! A new discovery last year, her blog is also awesome, her pictures are amazing and her review is also good too! Another beauty blogger, who actively review products! Great finds and lots of new product can be seen here! Not pocket friendly! So that all I think! I cannot put everything her of it will be endless. Haha. You can check out my blog list here! This is where I get all of my favorite blogger updates! wooo im going to stalk their blog too....but sometime sked reading too much cos they burnt my wallet when i saw something nice and i go purchase all of them!! thats why. Karla Sugar and Temptalia cannot be in here. they are just so good! lol! they can give me this un-healty temptation! Thanks Sab bagi banyak lagi beauty blog! aww... Thank you Nanie! u are the sweetest! I only followed stella, stylesuzi and the beauty department. thanks for the exposure Sab, nak gi tengok the others after this! hehe glad i help! welcome! haha! i don't really read guys blog! sorry! best kan best kan! zoella the best! aw.. your welcome! thank you dear! OMG! I've once crossed path with Cupcake's Clothes blog when I was online in school but forgot to follow it. Been looking for it all these time because I don't remember the blog name. Thanks! Finally I've found it again through your blog. Her style is quirky and I like it. yeke? hehe.. glad i made u found it back! she is really awesome and cute! hye there, being here and read ur post.. that is awesome.. start stalking them.. hehe..
haha! kene terjah.. ni la blog2 yg sab suka visit, beri inspirasi and mentor ntuk berblog. I like essie button and annabelle fleur from vivaluxury! i like mistymom and wendy's lookbook too! and i followed Stylesuzi on youtube. i think she is more of a youtuber than a blogger. Im like a baby to this make up and fashion world even though Im already 19 years old..